One of the questions I get the most often about the natural beauty products I use is: “Yeah, but do they actually work?” Somehow we’ve been brainwashed into believing that the bounty we harvest from the earth is worse for us than the chemicals we derive in a lab. Today’s featured brand proves that couldn’t be further from the truth. Skincando is the brainchild of Sara Damelio, an organic beauty specialist that had battled with chronic skin problems and acne throughout her teenage years. After having exhausted even the most high end brands, Sara was inspired to get busy and start experimenting with natural formulations, to see if anything would solve her skin conundrums once and for all. After 1,000 trials, she finally hit upon a winning formula, which is now known as Combat Ready Balm ($6-$65). Why the military reference you ask? Because this stuff is so tough and effective, it’s used by soldiers overseas to ease the pain and itching from sunburn, sand flea bites and parched, chapped skin from the desert conditions. This miracle balm however, also has a practical application at home, for those living in cold, dry climates (hello Canada), suffering from eczema, or dealing with that first sunburn of the season. Once you’ve fallen in love with the balm, be sure to try the rest of the Combat Ready collection ($10-$17), including a minty lip balm, an energizing bar of soap, and a must-have botanical bug spray to keep the skeeters away this summer. And if you’re feeling generous, you can also donate to have these products sent to the armed forces, whether in general, or to a specific service member of your choosing. While Skincando’s unisex, tough-not-gruff Combat Ready line is a fine entre into the brand, they’ve also got some other skin-quenching products that are perhaps a little more suited for everyday, normal use. The Luxe line kicks off with another miracle worker, aptly named the Miracle Cream ($12-$70). With each jar handmade to order the moment you want it, you’re guaranteed the freshest ingredients possible – meaning your skin’s fine lines will be that much more reduced while your skin tone will be that much more balanced. The Luxe line also includes a complementary eye balm, ultra-rich lip balm, and a lighter, vegan version of the original Miracle Cream for those that have oily or normal skin and don’t require quite as much ‘help’. While I’m sure the soldiers overseas are busy getting rough and tumble, it’s also worth noting that the little would-be soldiers prowling around your backyard are equally apt to spills, scrapes and other maladies. Skincando has a kid-friendly formulation of their ultra-soothing formulas, available in three sizes ($6-$65) to toss in your purse or keep at the ready whenever a minor disaster may strike. If you’re keen to give Skincando a whirl – and with the summer season coming up, it’s really the perfect time to do so – may I recommend one of their starter kits? The Combat Ready Kit includes all four of the products featured above, tucked into a neat industrial-style dopp kit, for a bargain price of $55. Meanwhile the Miracle Travel Kit features miniature pots of the Eye Balm and Miracle Cream, along with the Brew lip balm, for $25. Both make great gifts for busy moms with even busier tots, or for your kid that’s rocking a summer job outdoors this upcoming season. Skincando is readily available to Canucks that shop online – shipping starts at $10 for any purchase under $50, but it’s fully worth it! 1) Visit the Skincando website and tell me – which product would you most love to try and why? You have till June 4th to fill me in! 2) Entries are limited to one per person / per email address / per household (or more if you score bonus entries). A random draw will be conducted on or around June 5, 2014 to select the winners, who will have 48 hours to respond before another winner is chosen in their place. 4) Bonus Entry: Visit the Skincando Facebook Page, like them, and leave a comment on their wall re: what product you’d most love to try and why. Link back to your comment below in a separate comment and you’ll earn yourself an extra go at the big prize. I think that the Combat-Ready Balm would be great for my husband when he works on those big trucks……. he bounces around all day, he gets a rash. This balm would be beneficial. I would think that the Miracle Cream would be great for myself to even out my skin tone. I would most like to try the Combat Ready Gift Kit. My son is working as field research technician on a turtle conservation project in the bogs and swamps of Northern Ontario this summer and needs a deet free insect repellent. I think he would find the balm useful to. Great to pack in a care package for him. I would like to try the Combat Ready Bug Repellant – both my husband and I can’t spend a peaceful evening outside during bug seasons. I think the Brew lip balm sounds amazing! I’ve been looking for a new brand and I think this could be it! https://www.facebook.com/skincando/posts/668616209841129 so excited to try this! I would like to try the Combat Ready Balm. I would love to try the miracle balm! I’ve got uneven sensitive skin and currently am still trying to find the perfect balm that hydrates and won’t break me out. I would love to try the Miracle Cream moisturizer because my skin is very dry and has fine lines and wrinkles. I would love to try the Combat-Ready Bug Repellant because the bugs love my skin! I want to try the Miracle Cream. I would like to try the Vegan Miracle Cream as it is a light cream that can be used in the daytime. 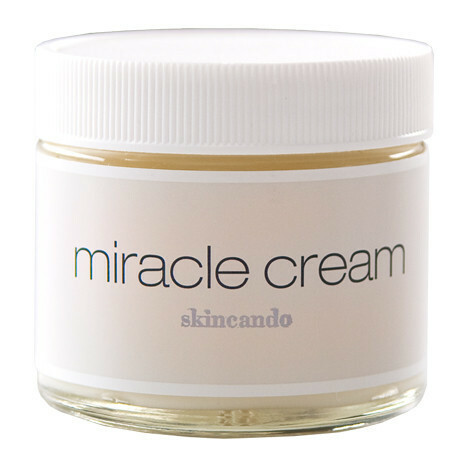 Visited the Skincando website and I would most love to try either their “Combat-Ready Balm” ‘cos I have eczema, or their “Miracle Cream” ‘cos I would like to diminish the appearance of fine lines, wrinkles and uneven skin tone. Can’t figure out which one would be the better choice as both are rather embarrassing. Thanks. I have really dry skin so Combat-Ready Balm would interest me. The Miracle cream also would interest me. I’d like the Luxe Miracle Cream most! It sounds like it would be great for my skin! I would love to try the combat ready balm because of it’s multi-tasking abilities! I would love to try the Eye Balm because dark circles are my nemesis! I’d like to try the Vegan Miracle Cream to even out my skin tone. I’d like to try the Miracle Cream and see if it really is a miracle! Miracle Cream or Combat Bug Repellant so hard to choose. I rarely use creams as I have sensitive skin. Bug repellant would be great because bugs love me. Combat-Ready Bug Repellant because last night the mosquitos made an appearance. I would like to try the Brew Lip Balm because my lips are always very dry. I would like to try the Miracle cream as my skin could really use a miracle. I would like to try the Luxe line. I’d love to try the Combat Ready collection ($10-$17), which includes a minty lip balm, an energizing bar of soap, and a must-have botanical bug spray to keep the skeeters away. The combat-ready kit looks great. I would love to try the Combat-Ready Bug Repellant, because I will be spending much of my Summer at the cottage and could surely use a bug repellent that is natural and effective. I would like to try the Miracle Cream for my dry skin. I would love to try theCombat-Ready Bug Repellant because I really really hate bugs around me in the summertime! I’d love to try the Combat-Ready Bug Repellant because I’ve had trouble finding a natural bug repellant that actually works. Combat Ready Gift Kit. SOS. Help. Pick me, pick me! Your next winner!!! Show me the money!!! It would be a dream come true & means more to me than anyone else to win. 😦 Starving artist here desperately needs the prize to look good, to have fun, feel alive & inspired again. A life changing experience. Top of my bucket list. Thanks for the awesomeness, the contest, & generosity. Dear Santa: I’ve been nice. My X-Mas wish this year is to win this contest! 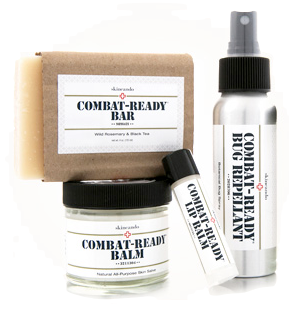 I would love to try the Combat Ready Balm because I do a lot of carpentry and really mess up my hands. Also our yard needs a lot of work, wild raspberrries everywhere this year. I think the Miracle cream is for me. I’d love to try some of that Combat-Ready Balm. It sounds like it must really work given its original use — I’ve very curious! I would like to try the Combat Ready Balm for our eczema. I’d love to try the Eye Balm. In the past I’ve not been too fussy when it comes to moisturiser (body lotion on the face, anyone? ), but I’m trying to be more grown up about what I put on my face. So an Eye Balm would be a good start. I would put the Naples top on my list. I would like to try the Combat Ready Balm for my extremely dry skin. I sure would like to try the Combat Ready Bug Repellant- it’s mosquito season! The Brew lip balm because summer or winter, my lips are always dry. I would like to try the Combat Ready Balm for my dry skin. I would most like to try the Combat-Ready Bug Repellant! We do a lot of camping and the mosqitoes are terrible! Hey sorry for such a random review, but I couldn’t help but comment after I read this piece. I can’t wait to try them. Everything looks amazing! I really like your reviews too – very honest and entertaining to read. Do you have one of Vain Pursuits? I’ve started to hear a lot about them and thought it’d be great to have more info!